The Xbox One S, Xbox One X go head-to-head. Which console comes out on top? Most of us, when we buy a new game console, have certain expectations about how it’s going to improve how we play. We want better graphics, better processing capabilities, bigger and better-looking games. With the 4K-capable Xbox One X, Microsoft wants to convince you that adding more technical firepower under the hood can improve your games, even if it doesn’t open the door to a new library of games. While the Xbox One X is a still an Xbox One, it is heftier, faster, and more powerful under the hood. And now, with the original Xbox One out of production, Microsoft is pushing Xbox fans toward its new hardware. The Xbox One X is the younger sibling of both the original One and the One S, with years worth of extra development and planning behind it. It should, in theory, offer substantial performance and feature improvements over its predecessors. But is it worth buying over its more affordable Xbox One S? If you own an Xbox One or Xbox One S and are considering making the jump, check out our in-depth comparison to see if it’s the right move for you. Since the Xbox One X is part of the Xbox One family, the biggest differences between it and the current Xbox One models are mostly internal. Microsoft has made distinct architectural changes to its design, instead of simply throwing more modern hardware at the problem of the Xbox One’s occasional power disparity with the PS4. The graphics chip in the Xbox One X packs 40 compute units into a slightly slimmer footprint than the Xbox One S, which has only 12. The cores in the Xbox One X are also optimized for DirectX 12 and will be clocked at 1,172MHz — much higher than the Xbox One and Xbox One S. The CPU offers a roughly 30 percent increase in clock speed, so it should be a lot more powerful in its own right. All in all, the graphical performance of the Xbox One X is around the six teraflop mark, which means it has a little less raw power than an Nvidia GTX 1070 desktop graphics card, or a little more than an AMD RX 480. That means the Xbox One X has more than 4.5 times the graphical performance of the original Xbox One. The Xbox One X comes with a full 12GB of GDDR5 memory as well, which will give developers a lot more leeway and really help the system handle 4K content. In comparison, the original Xbox One only has 8 gigabytes. The 1TB internal hard drive in the One X is as much as 50 percent faster, which leads to better boot times and a reduction in loading screens over previous generations of the console. 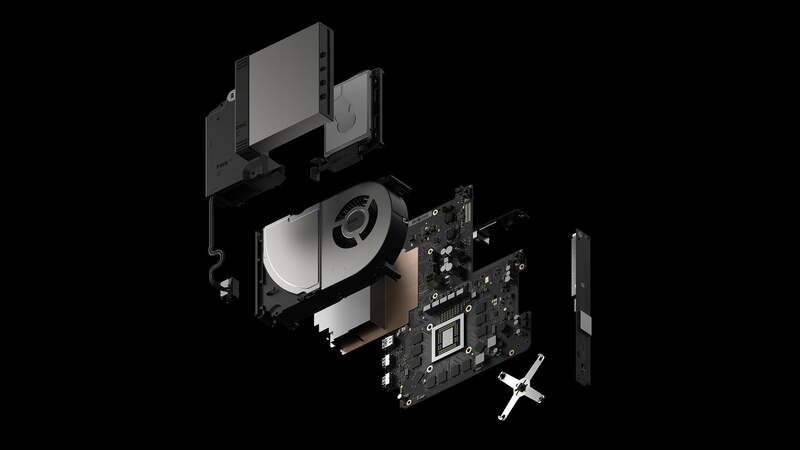 In terms of physical design, the Xbox One X sports a matte black finish, distinguishing itself from the white finish of the Xbox One S. With great power, comes (relatively) great weight. The Xbox One X weighs 2 pounds more than the Xbox One S. Despite the extra heft, the difference in physical size between the two is marginal. Either way, the days of the giant Xbox One crowding your media console are over. The consoles have identical port layouts on the back, and feature built-in power supplies. Both include a single USB port on the front, although on opposite sides. On the Xbox One X, the eject button sits below the disc slot, rather than to its side, like it does on the Xbox One S.
The main design difference between the two that may actually affect how you organize your entertainment center is fan placement. On the Xbox One S, heat comes through the top of the console when it is running. The Xbox One X disperses heat through the back of the console. This means that you can stack other consoles, DVD players, TV boxes, etc., on top of the Xbox One X without the fear of overheating your system. Even though the Xbox One X borrows a lot from the Xbox One S in its design, the reworked fan design gives the Xbox One X the edge. All of that power is designed to drive what is considered by many to be the next big benchmark for mainstream gaming: 4K resolution. At four times the detail level of now-standard 1080P, 4K offers crisper detail and more true-to-life visuals. Considering that the original Xbox One struggled at times to deliver 1080P at anything over 30 frames per second, a big part of the Xbox One X’s design is to enable Ultra HD resolution gaming at higher frame rates. 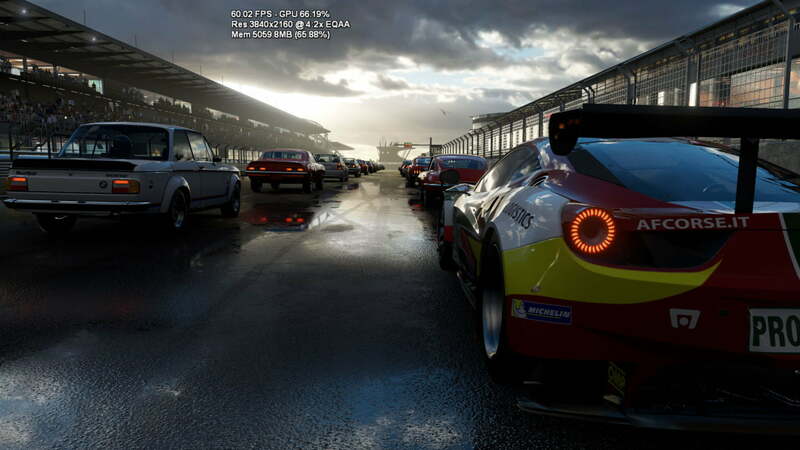 Since the console’s launch, many games have been updated to support full 60 frames-per-second and playback at 4K on Xbox One X. You can find a constantly updated list of those games here. Visuals in updated games are sharp, and the HDR brings intense light and murky shadows to life in a way no other console can replicate. But a lot of the appeal fades when it’s hooked up to a 1080p TV without the contrast and brightness needed for HDR. That is what most people are still using for their gaming, and the Xbox One X is certainly meant to be experienced on a high-end setup. Users with older TVs will still see some jumps in performance in regard to framerate and improved textures, but a 4K television truly unlocks the power of the Xbox One X. While the Xbox One X offers the capability of 4K streaming on Netflix or YouTube, until ultra high-speed internet becomes more commonplace, a 4K UHD Blu-Ray player will be a necessity for those who want to take full advantage of their 4K TV. While that means buying a player, if you can have that bundled with a console upgrade that also lets you take advantage of 4K gaming, all the better. There is no question here, the Xbox One cannot compete when it comes to 4K media support. The Xbox One S can, however, so it remains a viable option for anyone only looking to upgrade for that functionality. Like the Xbox One and Xbox One S, Xbox One X supports Microsoft’s own in-house developed HRTF, as well as bit rate passthrough for audio, and features Dolby Atmos support for those of us lucky enough to have such a setup. Since both the 4K Blu-Ray player and high-end audio solutions are available in both the Xbox One S and Xbox One X, either console comes in as an excellent addition to your home theater setup. However, the Xbox One X, as the newer, more advanced console, gives you more options to enhance your all-around entertainment experience. High Dynamic Range (HDR) is the other major display technology that hardware manufacturers are using as a reason for consumers to upgrade, and the Xbox One X comes with full support. This allows the system to work with displays that support HDR to display a wider range of bright and dark lights, usually with the help of OLED or local dimming. Explosions look like real fire, and shadows have greater detail, in a way that is hard to explain without seeing it. That is something that the Xbox One simply cannot do, so it falls behind there. Both the Xbox One S and Xbox One X support HDR 10 with compatible games and offer noticeable visual improvements. Much like the PlayStation 4 Pro, it’s up to developers to take advantage of the Xbox One X’s extra power with better framerates and native 4K support. Microsoft has been steadily announcing titles that support 4K and/or HDR, and we are keeping updated on those titles in another post. As far as game support goes, all games play on the Xbox One, Xbox One S, and Xbox One X. That includes access to the backward-compatible Xbox 360 library. A small selection of Xbox 360 games, including Halo 3 and Fallout 3, have even received Xbox One X updates for better performance. The biggest difference between the Xbox One X and Xbox One S is the price. The Xbox One X retails for $500. If you don’t have a 4K HDR TV, getting the most out of the premium console will cost you quite a bit more on top of that. The Xbox One S, meanwhile, costs around $300 for a “starter bundle” that includes a three-month Xbox Game Pass hat allows you to play a wide variety of games without purchasing them outright. The Xbox One S also regularly goes on sale, so you might find it for even less. There may not be a clear winner in the price discussion, but there is a clear loser. Even with meaningful performance improvements, the Xbox One X is a big ask at almost twice the price. If you don’t already own an Xbox One console, it might be an easier pill to swallow, but for those sitting pretty with an Xbox One or Xbox One S, the jump may not feel worthwhile. With the Xbox One horse race down to two consoles, you have the choice between power and affordability. The Xbox One S offers a quality system at a drastically lower price. For many, and especially those without a 4K TV, the Xbox One S is a great option. If you want to get the most out of your console games, though, the Xbox One X is the system to get, as it offers performance competitors just can’t match.